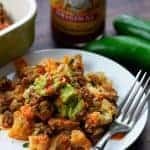 This low carb taco casserole will keep any Mexican food lover happy! Chop cauliflower into small florets and place in a 9x13 baking dish. Drizzle the cauliflower with olive oil and sprinkle with paprika, cumin, and salt. Toss to coat. While cauliflower is cooking, add the ground beef to a skillet and brown. When cooked through, drain the grease and return to the skillet. Add the paprika, garlic powder, onion powder, chili powder, salt and water to the ground beef and cook for 2 minutes. Remove cauliflower from oven and spoon the ground beef over the top. Top with Ro*Tel, grated cheddar, and Monterey jack. Cover tightly with foil and return to the oven for 15 minutes. Remove foil and sprinkle with cilantro. Serve with your favorite taco toppings. Nutrition information does not include any toppings aside from what's listed in the ingredients list.